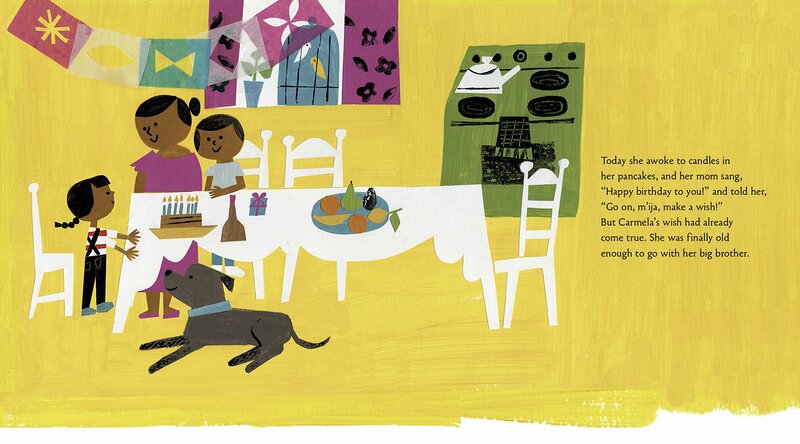 Summary: It’s Carmela’s birthday, and her wish has come true–today she gets to go with her brother. Riding her scooter through city streets, she sees the fenced-off repair shop, the crowded bus stop, and the home improvement store where her father used to stand around and wait for work. The two siblings go to the laundromat, then to the market. Carmela knows she’s annoying to her older brother, who doesn’t want her hanging around, but she doesn’t care. 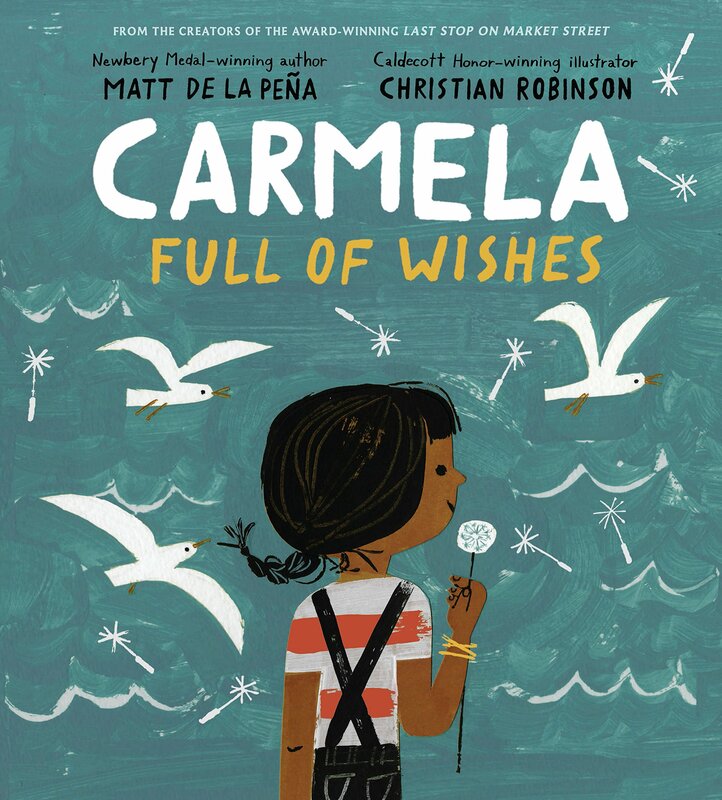 They go past their old apartment building, and Carmela imagines “her dad getting his papers fixed so he could finally be home.” Carmela finds a dandelion, and her brother tells her she’s supposed to make wishes on it. As they head for home, she falls off her scooter, and the dandelion is crushed. Her brother helps her up and checks that she’s okay. Then he takes her to a magical place by the sea where there are hundreds of dandelion seeds–wishes–floating through the air. 40 pages; ages 4-8. Pros: The award-winning team that brought you Last Stop on Market Street has done it again, with a story that doesn’t seem like such a big deal the first time through, but that grows on you with each rereading. The two kids are resilient, despite their difficult circumstances that are subtly woven into the narrative. This would be a great mentor text for showing character development; just like in Market Street, there are believable, likeable characters who slowly reveal their true natures as the story unfolds. Cons: I was hoping there would be some little intersection with C.J. and his grandma from Market Street. I love when universal truths take center stage with characters of varied backgrounds. The subtle threads come together so well.